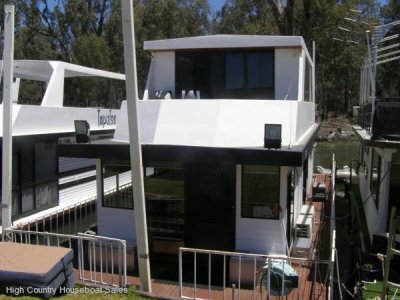 Houseboat Holiday Home on Lake Eildon, Vic. Just imagine sitting on your houseboat of an evening in a secluded inlet as the breeze pushes the clouds away and the majestic full moon comes out from the shadows and shines brilliantly; with the ripples on the water sparkling you can see the magic pathway into the heavens. 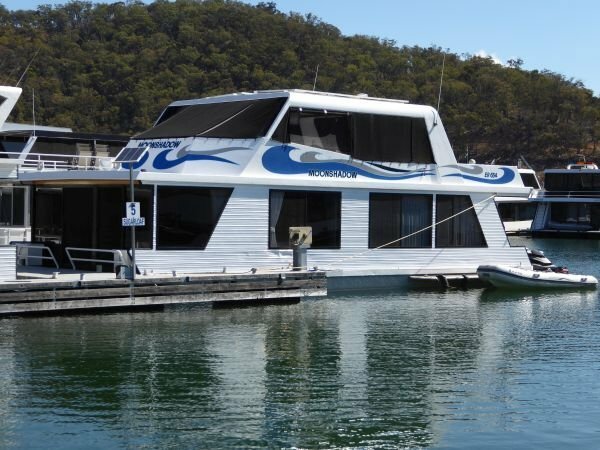 The magic of Eildon on your houseboat holiday home, Moonshadow. Moonshadow is an exceptionally presented family holiday home. 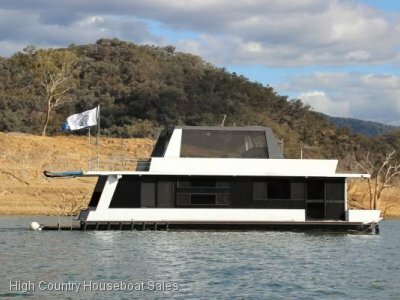 Significantly, Moonshadow is a full width 18 feet wide houseboat, this implies the Cabin is about the same size as on a 20 feet wide houseboat. This couple of feet makes a big difference in the rear lounge and bedrooms. Importantly for a Family there are 3/4 very good-sized Bedrooms, all serviced by a very well-appointed Bathroom with a new Hot Water Service. 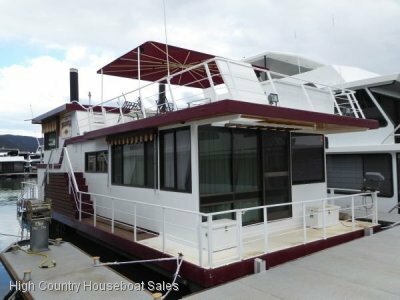 Moonshadow has a rear Lounge with large windows to let views of the magic into the houseboat. This encompasses a well-appointed kitchen with new electric Fridge/Freezer and new Oven. 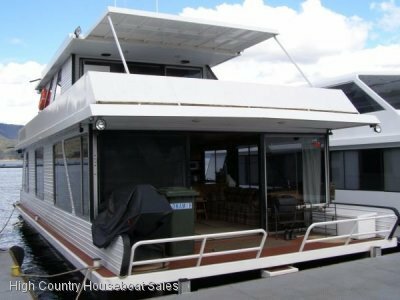 The rear Lounge opens onto a spacious Rear Deck with the essential Hydraulic Duckboard. Internal stairs take you up to the other Lounge for the other Generation to relax and enjoy. The upstairs area can be used all year round with Targa & Full Hardtop with a full set of All-Weather Screens and Fly Wire Screens. Importantly there is an area to lay back on the Sun Lounges and enjoy the Sun and the magnificent Scenery. With Moonshadow, you can walk on and your Family can commence enjoying good times as all the big-ticket maintenance items are under control. She was slipped in January 2018 with a GMW CHIR. The pontoons sit well in the water with plenty of buoyancy. She has an ESV Gas Compliance Plate. Exterior painting is up to date. The Solar Electric Technology is high quality with the MUST Pro Series Inverter/Charge System; MUST Solar Charge Controllers; very good House Batteries and large new Solar Panels. This is all backed up by a Quicksilver Generator. Plenty of Power. Moonshadow ticks all the boxes as an ideal family holiday home; just imagine your family embracing the magic. For More Detailed Information & Access To Extra Photos Please Go To "Emaiol The Seller For More Information". Open Front Area/BR4: Helm; Rudder Indicator; 4-seater Couch/Double Bed. BR2: Queen walkaround bed; Side Drawers & Lamps; Twin Wardrobes, Cupboards & Vanity. BR3: 2 x single Beds Bunk; Wardrobe; Underbed Storage. Kitchen: Pantry with Fuse Boxes; Generator Remote Start; New Westinghouse electric Fridge/Freezer; New World Oven, Grill, 4 burner Cooktop gas; Everdue Rangehood; Servery x 3 stools. She was slipped in January 2018 with a GMW CHIR. The pontoons sit well in the water with plenty of buoyancy. She has an ESV Gas Compliance Plate. Exterior painting is up to date.